We save the bones from chicken quarters, turkey drumsticks, and other pieces of poultry that pass through our kitchen. They get tossed into the freezer, and when two freezer bags or so get full, it’s time to make a pot of chicken stock. I joke about renaming winter to “baking season.” It’s soup season, too. Chicken soup to ward off the cold, leek and potato soup for variety, split pea soup with its pork cracklings… Chicken stock goes into stir fries and sauces too. Very useful to have around. Since we’re trying to eat more vegetables and less meat, we don’t have that many bones to cook with—not as many as we would want if we’re having soup weekly. Fortunately, a large bag of chicken bones costs $1. The largest stock pot we have can fit two bags of bones initially, with a third squeezed in once the chicken bones settle. This is what all that stock looks like: three layers of containers, probably around 40 cups. 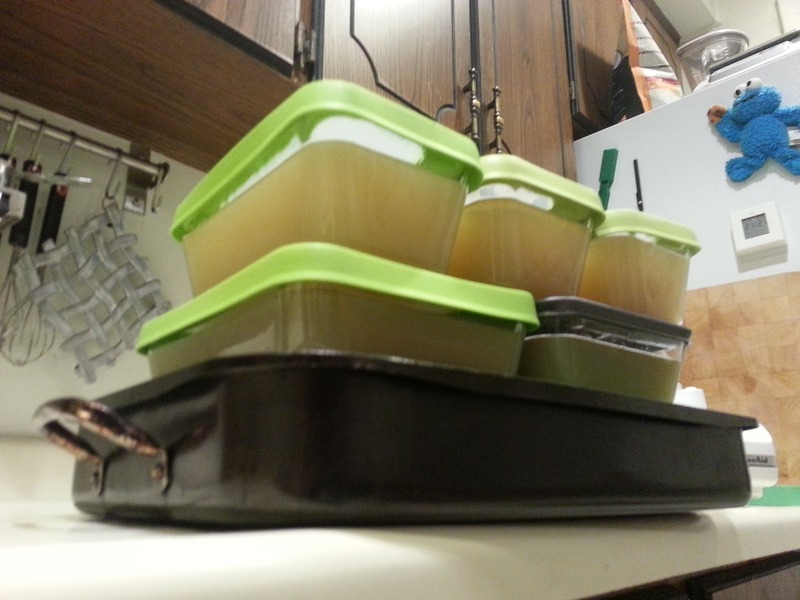 There’s no room in the fridge (there’s a turkey defrosting) and the stock has to cool before we can freeze it, so W- took the containers to the shed, where they’ll cool (and most likely freeze, too). Side benefit of winter: free cold storage. Not quite a walk-in freezer (at least until it hits -18C), but decent at chilling things quickly. I want to learn how to make vegetable stock as well. That’ll give me another use for all these vegetable odds and ends, and it might lead to other interesting soups along the way.